I was very pleased to receive my order from Adlibris this week. 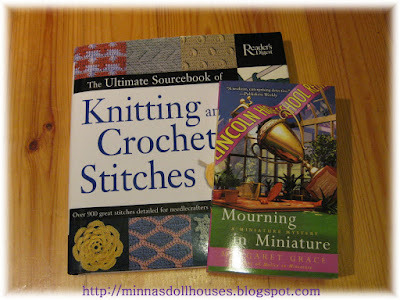 I bought these two books: "the Ultimate Sourcebook of Knitting and Crochet Stitches" by Reader's Digest and "Mourning in Miniature" by Margaret Grace. Some of the crochet stitches in the book are same as the stitches in my favourite crochet book "300 Crochet Stitches", but there are also several new ones. I am already crocheting one of them, as I am making a shawl for one of my dolls. And the other book, it is the fourth novel in Margaret Grace's miniature mysteries series. I have enjoyed so much reading the first three books and I am sure that I am going to have a good time reading this one, too. Olin hyvin tyytyväinen, kun sain viikolla tilaukseni Adlibriksestä. Ostin nämä kaksi kirjaa: Valittujen Palojen "the Ultimate Sourcebook of Knitting and Crochet Stitches" ja Margaret Gracen "Mourning in Miniature". Jotkut kirjan virkkausmalleista ovat samoja kuin suosikkivirkkauskirjassani "300 Crochet Stitches", mutta siinä on myös paljon uusia malleja. Kokeilen niistä jo yhtä, kun virkkaan hartiahuivia yhdelle nukeistani. Ja toinen kirja on Margaret Gracen miniatyyrimysteerisarjan neljäs osa. Olen nauttinut tosi paljon muiden kolmen kirjan lukemisesta, ja uskon että tämänkin kirjan parissa on mukavaa. "God Jul och Gott Nytt År"
på dig också. Här får vi nog en VIT Jul i år. Vi har snö och kallt. MERRY CRISTMAS,MINNA!OBRIGADA E FELIZ ANO DE 2010 COM MUITA PAZ,SAÚDE E FELICIDADES!BEIJOS DO BRASIL. Merry Christmas to yo too Minna!